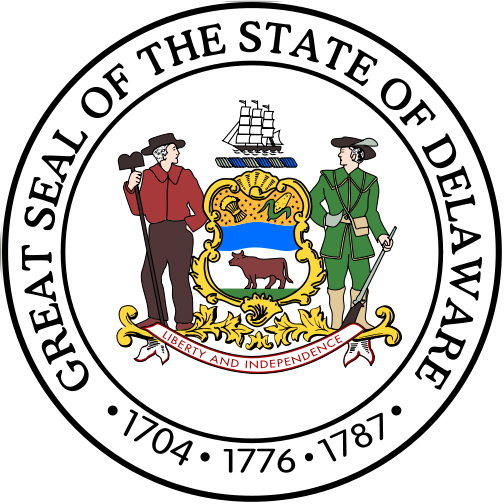 Seal of Delaware (public domain image on Wikipedia). 1704; year of the first Delaware General Assembly. 1776; year independence was declared from Great Britain. 1787; year Delaware ratified the United States Constitution (becoming the first state). Ship - a symbol of Delaware's ship building industry and extensive coastal commerce. Farmer - represents the central role of farming to the state of Delaware. Militiaman - recognizes the crucial role of the citizen-soldier to the maintenance of American liberties. Wheat Sheaf - a symbol of the agricultural vitality of Delaware. Maize (Indian Corn) - symbolizes the agricultural basis of Delaware's economy. Water - represents the Delaware River, the state's main artery of commerce and transportation. Ox - signifies the importance of animal husbandry to Delaware's state economy. Motto - "Liberty and Independence" was approved in 1847.